We have traced in previous chapters Hua’s remarkable rise to the apex of the Chinese political system from his very modest beginnings in Shanxi during the 1930s and 1940s, his two decades rising steadily, albeit unspectacularly, through the political ranks in Hunan and then just five-and-a-half years in the central party apparatus in Beijing. AsHua assumed top spot as head of the party, the state and the military, it seemed, on the face of it, that his tenure was impregnable. 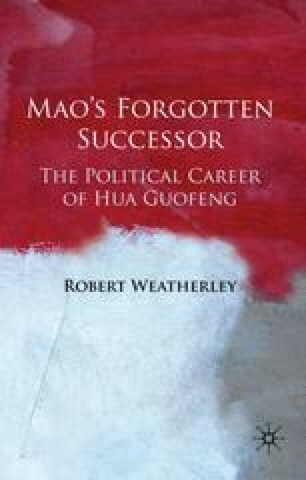 Hua’s arguably decisive action in authorising the arrest of the Gang of Four removed a major impediment to his authority (particularly the removal of Jiang Qing) and met with widespread approval within the party and throughout the country. His most obvious challenger as paramount leader was Deng Xiaoping, but he was languishing in the political wilderness following a vociferous campaign against him that had culminated in his purge from office after the Tiananmen demonstrations of April 1976. Add to this, Hua’s closeness to Ye Jianying and Li Xiannian as well as his alliance with the Secret Police Left and Hua looked well set to remain in power indefinitely.